From January 2018 on you can accompany us through the Bremen Space Year. 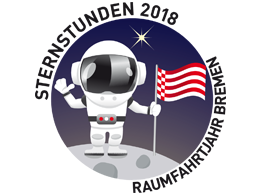 Get inspired by events, exhibitions and entertaining as well as informative offers around the subject space according the motto STERNSTUNDEN 2018. The Bremen Space Year starts with the opening of the exhibition Space Girls Space Women in the Universum® Science Center Bremen on 11th January 2018. Be with us until the end and get a taste of the congress life of the IAC (International Astronautical Congress) at the Public Day on 5th October 2018! Don’t forget to take a look into the event calendar regularly - new events are going to be added throughout the year! Photo exhibition "Space Girls Space Women"
Space travel is a man’s thing? As if! The photo exhibition “Space Girls Space Women” presents 24 women from the space industries and aeronautics sector: Girls who are with their thoughts in space, students who are enthusiastic about unknown worlds, experts who are standing in the centre of the adventure “space”. Inspired by the international travelling exhibition, the Universum® additonally shows seven portraits of women from Bremen, who pursue their dream job in space. The project was realized by the international photojournalism agency Sipa Press and has been made possible thanks to the commitment of founding partner European Space Agency (ESA). CNES, the NEREUS network, La Cité de l’espace, and the GSA are also participating in this co-production. Spherical music, images from outer space and a floating astronaut - the opening ceremony of the 54th Sixdays Bremen is all about the space year Bremen "Sternstunden 2018". On Thursday, January 11th, the former astronaut Thomas Reiter and Dr. Fritz Merkle, board member of the space company OHB SE, fire the starting signal at ÖVB arena. The production team Klangfeld provides musical accompaniment for the opening ceremony. Professor Dr. Frank Kirchner is going to give a lecture on the „Dive into the depths of Jupiter's Europe” on 13th January 2018. Kirchner is the area Manager of the DFKI Bremen and is responsible for the field of research “Robotics Innovation Center” with over 100 colleagues. Since 2002, the university professor holds head of the chair for robotics in the special field mathematics and informatics. Furthermore, he is the scientific director of the Brazilian Institute of Robotics since 2013 and was voted as a full member of the Berlin-Brandenburg Academy of Sciences and Humanities in 2015. 2017, he received the honorary doctorate for his forward-looking research on the field of Robotics and artificial intelligence by the Brazilian university Centro Universitário SENAI CIMATEC. One of the biggest questions of humanity: Are we alone in the universe? Robotics as well can contribute to get closer to the answer. The Robotics Innovation Center of the German Research Center for Artificial Intelligence (DFKI) researches the use of robotics for the exploration of space and foreign planets, like within a mission to the Jupiter’s moon Europe. There is a deep ocean - so the assumption - located under a several kilometers deep ice layer which could be a basis for extraterrestrial life. For being able to reach and explore the ocean, an exploration car has to pierce the hefty ice layer first. Then it has to navigate safely to the ocean bed. For this scenario, scientists of the DFKI developed a mission-concept which should make the exploration of the ocean on Europe with the help of a fully autonomous robotic system possible. On 13th January 2018, UMD Dr. Susanne Gläß is going to give an introductory speech about the concert with music from Mexico: Sueños – Dreams of a better world. "Wissen um 11", the Science Matinee in Bremen, presenting exciting and current science topics every Saturday at 11 o’clock in thirty minutes. We ask for your understanding that the space availability in the Olbers-Saal is limited to 195 persons for fire protection reasons. What does the world of tomorrow look like? What should we know? What can we do? How do we want to live? What does the world of tomorrow look like? What should we know? What can we do? How do we want to live? At the start of a series of events in the north of Bremen, event organizer Cynthia Bolen-Nieland and speaker Prof. Dr. Joachim Treusch, physicist and former Rector of the Jacobs University Bremen, welcome you on the Schulschiff Deutschland. As part of this New Year's speech and in connection with the Bremen Space Year, the speakers are dedicated to the topic of education. "What does the world of tomorrow look like? What should we know? What can we do? How do we want to live?" "Forecasts are difficult, especially if they affect the future." This old saying is true. But it does not relieve us of the responsibility to plan our future. Future scenarios therefore have a good sense for all error risk, if they are checked constantly and self-critically. We have been taught for the past three years which unpredictable developments can surprise us. Nevertheless - there are long-term lines: A quick solution is not in sight, a long-term solution can only exist in the worldwide improvement of the education of future generations. Politics and science share the responsibility. Admission is free. A donation for the Schulschiff Deutschland is welcome. Due to the limited number of places is a registration required. That is possible on the phone number 0421-632214. Get to know the Institute and current projects within a guided tour through the laboratories: Why do we want to grow tomatoes on the moon and the mars? How can a lander land on an asteroid and how do we supervise the ships in the outer space? Those questions are answered by the current projects. Furthermore, you have the possibility to take a glance into a selection of our laboratories and experimental facilities: The integration laboratory, in which satellites are built together, the modular testbed (Landing and Mobility Test Facility – LAMA) in which the well-known philae lander was tested or also the Kryo-laboratory, in which scientific and technical questions of the cryogenic fuel handling (Treibstoffhandhabung) are tested. Dive in into the world of Space Research and experience which part Bremen plays in it. On Saturday, January 27, Martina Wilde will give the lecture "From the deep sea to the Moon: retrospective of the Helmholtz Alliance ROBEX". Since mid-March 2013, Wilde is leading the Helmholtz Allianz ROBEX - Robotic Exploration of Extreme Environments as a scientific coordinator at the Alfred Wegener Institute for Polar and Marine Research (AWI) in Bremerhaven, Germany. She has a degree in physics and works in the management of space projects at the German Aerospace Center DLR since 1990. She brings her many years of experience, especially in the field of robotic exploration of the solar system into the alliance to seek synergies between space and deep sea research. What connects the deep sea with the moon since 2012? The Helmholtz Alliance ROBEX, in which 120 researchers in 16 institutions throughout Germany worked together for five years on innovative solutions for the future exploration of the deep sea and the moon. In the talk, the speaker looks back on goals set by the researchers by the end of 2017 and compares them with the results achieved in the two demonstration missions in the Arctic Ocean and on the volcano Etna in the summer of 2017. In addition to the review, the speaker also gives an outlook on how the extraordinary cooperation will continue. On Saturday, February 3rd, Dr. Marco Scharringhausen will give the lecture: Towards our neighbour stars - borders of our solar system. In keeping with the motto STERNSTUNDEN 2018, the year begins with a rare event: On 30.01.2018 there will be a blue moon - a second full moon within a calendar month! Take advantage of this rare moment and experience the "Blue Moon Special" at the Olbers Planetarium: Once in a Blue Moon - who doesn't know this song? There are at least seven versions. In this atmospheric setting, we bring you closer to the history of the Blue Moon. Very rarely does the moon show a bluish hue. At moonrise and sunset it looks red and yellow. When the moon is high in the sky, it looks white. In fact, anthracite is the color of the moon because its reflectivity is very small. While the Earth reflects 39 percent of the sun's light, the moon only throws 6.7 percent back. Each including a glass of Blue Moon Beer! What is even rarer than a blue moon? Exactly: a double blue moon! A rarity that occurs about four times a century. Like it’s been made for the Bremen Space Year! On the 31st of March the time has come. And also for this occasion, the planetarium opens its doors to the 2nd special "Blue Moon-Special". Such an extraordinary event must be appreciated. That's why we are giving away 1x2 tickets for the "Blue Moon-Special" on January 30th and March 31. The information for the raffle on the 30th of January will follow in a few days! Further information about the raffle for the event on March 31st will follow in mid-March at www.sternstunden2018.de as well as on Facebook and Twitter. From the Weser to Mars: 4000 years of discoveries – When citizen of Bremen move into the world! For about 4,000 years, there are inhabitants of Bremen. Most of them just did not suspect that they are some. And they have always been pulled into the distance. Just why, Bremen is the most beautiful place in the world? In the lecture you will go with the speaker Thorsten Kropp, historian and photographer, in search of traces in the past, to see what lies ahead. Because distance is often closer, if you dare to take the first step. So it is already written on Schütting "wagen un winnen" (dare and win). Due to the limited number of seats, is a registration required and can be made by calling 0421-632214. The motto of the 33rd Carnival of Bremen 2018 is: "Lost in Space"
Intoxicating, colorful, glittering and exotic, this is how the carnival in Bremen presents itself. On 2 and 3 February 2018, it's that time again: The fiery temperament of the people of Bremen takes over the helm instead of the otherwise well-known Hanseatic coolness and Bremen celebrates Germany's largest samba and mask carnival. To hot samba rhythms like the sugarloaf, around 40,000 visitors of the Samba carnival in Bremen will be dancing through the streets of the city on 3 February, when the colorful and sweeping costumes, the drumming sambistas, bizarre mask games, fiery dances and expressive stilt art in the grand carnival parade pass them by. At 12 o'clock the annual opening ceremony takes place on the market square before dancing and drumming towards Ostertorviertel. More than 1,500 participants in around 70 samba groups from all over Germany, the Netherlands, Denmark, Poland and Great Britain are once again inspiring their audience this year. For many years, the initiative Bremer Karneval e.V. has been creating political, socio-critical or artistic themes for the Bremen mask and samba spectacle, which then give shape to the changing mottos. The Bremen Samba Carnival is celebrating its 33rd edition matching with the STERNSTUNDEN 2018, the Bremen Space Year, under the motto "Lost in Space". We are convinced that it is not just the second socks that disappear inexplicably in the washing machine universe. Many of our wishes, hopes and often good intentions do not survive time and space, but get lost in everyday life. And where did that disappeared? In space, in the infinite wide’s of the universe? As always, the motto of the sambistas, stilt walkers and masquerades can be interpreted in many ways: whether as a metaphor for life, as a utopia or a short escape from reality, everything can be at the Bremen Samba Carnival. The beginning of the wonderful weekend is, as every year on Friday afternoon, created by the small carnival revelers in the Bürgerhaus Weserterrassen. From 4 pm, the children can expect a colorful program under the motto "Lost in Space". Also in attendance are the Tanzhafen Akademie Vegesack, the Tanzstudio Bounce and Boogie of Bremen und the Circusschule Jokes. Afterwards it goes out on the terrace, where winter will be taught fear with hot punch and with much music, fire and mighty noise. Bright mask and stilt figures promenade on Friday evening through the narrow streets of the Milchquartier. A fairytale, poetic world of soft sounds and luminous fantasy figures opens up to the spectators and invites to marvel and linger. The latest creation of Stelzen-Art once again promises something spectacular. Nothing less than the universe is united in the two new big figures. Mars and Venus, as the archetypal symbol of male and female, are brought to life with light, colors, projection and music. For this project, the two Stelzen-Art artists Janine Jaeggi and Martin Sasse got the video artist Julian Hölscher and the sound designer Thomas Friedrich Werner (freelancers at Urbanscreen) on board of the space ship. Thus, the luminous figures walk through the mystical streets of the Milchquartier, as little harbingers to the International Astronautical Congress (IAC) 2018. Starting point: Kubo, at the Paulskloster. The sparkling creatures swarm from here. We thank the residents for their hospitality and ask all viewers to treat it with respect. Luminous figures: Edgewise, Oeakleaf Creativity, Stelzen-Art. Dance: Alegria. Masks: Trottellume, Die Schalotten. In the context of the "Lichtertreiben"/ Bremen Carnival 2018 "Lost in Space"
Stardate 2.2.20.18 - the galactic dance night before the parade: with the "putting the heat on ticket" ("Einheizticket") you can experience it. Because today, the sambistas from all parts of the Milky Way arrive in Bremen and dance drumming through the starry night. The hottest invitation to dance at three different locations in the "Viertel". On Saturday, February 3rd, Dr. Marco Scharringhausen will give the lecture: Towards our neighbour stars - borders of our solar system. Scharringhausen studied mathematics in Oldenburg and Osnabrück and then worked in the field of environmental physics at the University of Bremen. Since 2007 he has been a space-excited employee of the German Aerospace Center at the Institute of Space Systems in Bremen, where he us engaged in the exploration of planets and other bodies in our solar system. Exploring the limits of our solar system, we venture into the cold regions of Neptune and Pluto and find that there is no road sign out there saying, "You're leaving the solar system now." So, where does the solar system end and where does the next one start? What kind of objects are out there? The space beyond the planets is anything but empty. But when will it be possible to get there by spaceships or spacecraft? On Saturday, February 10th, Prof. Dr. med. Justus Notholt will give the lecture: Earth remote sensing – Satellites and climate research. For many years, the Initiative Bremer Karneval e.V. as the organizer of the annual Samba and Mask Spectacle of Bremen has been creating political, socio-critical or artistic themes, which are then expressed in the changing mottos. A highlight of the motto presentation is the annual opening ceremony on the marketplace. With the involvement of hundreds of sambistas, dancers, stilt walkers and mask players in their colorful and exotic costumes, the respective theme is implemented in a variety of creative ways. Lost in Space - how practical, you can say this to everything that you would like to make disappear. But there are specialists who know about night-time exploration of space: the moonstruck. They are sent to find what was lost. In their quest, they encounter strange planets and constellations. And what do they bring back from outer space? Astronomical sambistas, cosmic stilt-walkers, interstellar mask player and moonstruck dancers, this is how the carnival people transform the city from the market square to the Ostertor as more than 100 samba groups from all over Germany, Denmark, Great Britain, the Netherlands and other parts of the blue planet move through Bremen's streets. The big prom in the Schlachthof under the motto "Ball in Space" becomes the completely detached Samba party from outer space. A cosmic universe full of rhythm and dance unfolds on all levels from the Kesselhalle, café and cellar. Absolute star hours for carnival fans from Bremen with dance until the early hours of the morning with cult DJ Jocar! nordbord Bremen – Science Club im Universum®: "Science and Fiction"
The popular science fiction genre delights young and old: Human beings and objects are beamed there and back within fractions of a second, laser swords belong to everyday life and extra-terrestrials naturally meet each other. What of this is real science and what is entertaining fiction? Children and teenagers between the ages of 10 and 19 get to know the answers to these questions in the project "Science and Fiction" by nordbord Bremen – an initiative of the associations NORDMETALL, AGV NORD and the Universum® Bremen. The offer takes place in cooperation with the DLR_School_Lab of the German Aerospace Center. Participation is cost-free and limited to 20 participants. Prerequisite for the registration is a prior, also free registration at "nordbord Bremen - Science Club in the Universum®" under www.nordbord.de. Mon. - Fri.: 9 a.m. - 18 p.m. Sat. - Sun. : 10 a.m. - 18 p.m. Holidays: 10 a.m. - 18 p.m.
On Saturday, February 10th, Prof. Dr. med. Justus Notholt will give the lecture "Earth Remote Sensing - Satellites and Climate Research." Notholt studied physics in Göttingen and Kassel and did his doctorate in physical chemistry there. Then, he spent two years at the European Joint Research Centre in Ispra / Italy, where he switched to atmospheric research. Subsequently, he worked ten years at the Alfred Wegener Institute Helmholtz Center for Polar and Marine Research and has been a professor at the University of Bremen since 2002. Remote sensing has established as a valuable measurement method in environmental and climate research. The lecture will first explain the basics of remote sensing and satellite observations. Subsequently, some examples from the environmental and climate research will be discussed, in which the remote sensing is used. These include sea ice extent, stratospheric ozone depletion, air pollution and global warming. ZARM - the drop tower in Bremen. How does it work and what happens in it? What is weightlessness? We explain you in an easy-to-understand drop-tower-visit what we do at the drop-tower. Further you get the chance to try out what happens in weightlessness with small hand experiments. Afterwards we will show you the ZARM integration hall in which our experiments are prepared. LiS-seminar for teachers: "The Moon"
The moon fascinates humans since primitive times. It’s the basic for the recognition for many calendar systems and serves as a reference point in the sky. The phase change of the moon can be observed very well from Bremen without any technical help. However, it’s still often unclear, how the moon phases develop and which influences it has on the earth. Furthermore is the moon full of secrets, like its backside, which is never seen from earth or the discussion about the moon landing. The further education offers, besides a content introduction about the moon, the focus for an individual testing and execution of teaching blocks. For that matter, the main focus is at models, which can be actively used by the students. Additionally, a topic is going to be the construction and/or use of a Tellurion, depending on the availability on the own school. Moreover during the further education, you get to know the planetarium as an out of school learning space. Possibilities for preparation and post processing of a visit are going to be discussed and time for content questions will be planned. Desirable would be an active exchange of own experiences and examples which can be brought, presented and added. The participation on this further eduaction is just for teachers. You would like to do something very romantic on Valentine's Day? How about a date under the starry sky of the planetarium? In the "Valentine's Special" on February 14th at 6 pm you will learn all kinds of things about love and the stars. Of stars that don’t exclusively cross our galaxy, of the life of Saint Valentine and of hearts, which can’t only be found on earth. From the Greek goddess Demeter and her reasons why she makes the flower of love blossom again year after year. Do you know the love story of Andromeda and her hero Perseus? And learn the secret why you should definitely watch a lunar eclipse together! Each including a glass of sparkling wine! Grab the stars and win 1x2 tickets for the "Valentine's Special". Further information will follow at the beginning of February on www.sternstunden2018.de as well as on Facebook and Twitter. The next "Valentine's Special" of the Olbers Planetarium Bremen will take place on the same day, February 14th, at 9pm. How about a date under the starry sky of the planetarium? In the "Valentine's Special" on February 14th at 9 pm you will learn all kinds of things about love and the stars. Of stars that don’t exclusively cross our galaxy, of the life of Saint Valentine and of hearts, which can’t only be found on earth. From the Greek goddess Demeter and her reasons why she makes the flower of love blossom again year after year. Do you know the love story of Andromeda and her hero Perseus? And learn the secret why you should definitely watch a lunar eclipse together! The first "Valentine's Special" is the same day at 6' o clock. In the Bremen Space Year non-members can sign up for WiA Bremen events, too. If one thinks of the effects of space travel on our everyday life, one probably first thinks of the Teflon pan (Teflon as a material of the heat shields). Much more influence, however, has been driven by the space program's erratic development of microelectronics. Without this push, there probably would not be any computers for everyone and everything - and no smartphone. A second, even less well-known "waste product" of space travel are methods that have been so profoundly improved in production and logistics processes that technical products are much more reliable than, for example, in the fifties before space began. Professor Dr. Werner Bergholz will guide you through this evening. After gaining his doctorate in physics in 1978 at the University of Göttingen and several stays abroad, Werner Bergholz worked in the Siemens microelectronics division in research and production from 1985 to 2002, most recently as the head of quality management at a chip factory. In 2002 he was appointed Professor of Electrical Engineering at Jacobs University, where he researched and taught in the fields of microelectronics, photovoltaics / renewable energy and quality management. He has retired since 2016, but continues to work in the fields of international standardization, quality management and photovoltaics (PV), among others, on the development of PV systems with 30 percent higher efficiency. Fantasy and science are no contrasts but complement each other very well! This becomes clear with the experimental reading of the book “Das Raumschiff der kleinen Forscher” by author Joachim Hecker. Curious visitors from the age of 8 years listen to the story of Kim, Vanessa and Metin, who experience unbelievable adventures with a cute hamster. The so-called „Space Hamsta“ owns an intergalactic spacecraft und invites the children to a flight to its home planet. The book is filled with various experiments that are performed by Joachim Hecker and the children during the 45-minute event. Science in Dialogue and the House of Science (Haus der Wissenschaft) invite to a discussion meeting with experts from science and practice. The MINT-Day (mathematics, informatics, science and technology) at the University of Bremen invites teachers to visit their student labs to get to know interesting projects and to try experiments. Furthermore, they can get information about current research topics. The MINT-Day is a joint project of Bremen University and the Bremen state institute for school in cooperation with several research and educational institution. This years main focus is space research. On Saturday, March 10th, Dr. Benny Rievers will give the lecture "The resolution of the Pioneer Anomaly". Rievers has been a research associate at the Center for Applied Space Technology and Microgravity (ZARM) at the University of Bremen since 2006. He received his doctorate in the department of promotion technology in 2012 and was honored in 2013 as a junior scientist by the der Werner-von Siemens-Ring Stiftung. In addition, in 2014 he received the Zeldovich medal from COSPAR and the Russian Academy of Sciences in the category Fundamental Physics. The speaker explains in his lecture the solution of the Pioneer anomaly, a slowdown of the identical NASA probes Pioneer 10 and 11, which was unclear until 2011. Often traded as experimental evidence of the need for a new physics, the existence of the Pioneer anomaly triggered a multitude of scientific works to modifications of the General Theory of Relativity. However, as detailed in the lecture, the key to interpreting anomalous measurements is first of all in a good modeling of all the technical and systematic aspects of a satellite. In the case of Pioneer 10 and 11, the observed anomaly could finally be attributed to the anisotropic heat radiation of the space probes. The speaker will discuss in detail the way to this realization and the significance for future missions in his lecture. Science and research are totally exciting, children can experience that at the children-university in Bremen. In our lecture program, researchers from the University of Bremen explain to them clearly what makes them so enthusiastic about their field of expertise. For example, children aged 8-12 learn why you do not have to fly into space for space research. The main focus of the DLR_School_Lab Bremen is on the theme space flight: How do humans and technology get into space and which conditions have to be coped with? How is the earth observed from space? How do astronauts get into space? What does make the planet mars so interesting and what does it have to do with Bremen? Classes that are interested in those questions are very right with a school visit at the DLR_School_Lab Bremen: Because we are booked up to a half a year in advance, is here a possibility to get hold of a visit at the DLR_School_Lab Bremen in the Bremen Space Year 2018. Science and research are totally exciting, children can experience that at the children-university in Bremen. In our workshop program, for example, small researchers are invited to plan and conduct their own little Mars-mission on the basis of hands-on experiments. The seat capacity is restricetd. Tickets can be purchased from the 01.02.2018 on nordwest-ticket. The event is for children from ages 8 to 12.
nordbord Bremen – Science Club im Universum®: Sketchnotes-Workshop "Space.Kritzeln"
Unexplored worlds stimulate the fantasy and creativity of scientists but also of comic artists and filmmakers. In a special workshop, young people form the age of 14 explore current and classic questions concerning space travel and illustrate the underlying scientific facts with the help of sketch notes. Sketch notes are an easy and funny way to visualize content with pictures, writing and symbols. No previous knowledge needed! The offer is a cooperation of nordbord Bremen – an initiative of the associations NORDMETALL, AGV NORD and the Universum® Bremen – and the DLR_School_Lab of the German Aerospace Center. Kerstin Meier, expert for visual thinking and sketch notes, supports it. Participation is cost-free and limited to 20 participants – registration opens in February 2018. Prerequisite for the registration is a prior, also free registration at "nordbord Bremen - Science Club in the Universum®" under www.nordbord.de. Very close to the Blue Moon! SAVE THE DATE! On March 31, 2018, the Blue Moon will lighten up for the second time this year! A rarity that occurs only about four times in a century. Take advantage of this moment and visit the "Blue Moon Special" at the Olbers Planetarium: Once in a Blue Moon - who doesn't know this song? There are at least seven versions. In this atmospheric setting, we bring you closer to the history of the Blue Moon. Including a glass of "Blue Moon Beer"! Such an extraordinary event has to be celebrated. That's why we are giving away 1x2 tickets for the "Blue Moon Special." Further information will follow in mid-March at www.sternstunden2018.de as well as on Facebook and Twitter. Moon ride on earth. Bremen rides bike to the moon and back. From April to October 2018, Bremen is heading for the moon! Round trip. Bremen BIKE IT! calls out for collectively riding 720,000 km by bike! The "Moon ride on earth" is recorded with the Bike Citizens App, which you can download for free for Bremen and Bremerhaven in the Google Play Store and App Store. In addition to the collective performance, there are monthly individual competitions, which are also held via the Bike Citizens App. The winners of this part challenge can look forward to great prizes! Anyone who is traveling in Bremen with the free available Bike Citizens App can join in - on two wheels, of course! Registration for the monthly part challenges is possible from 10.03.2018 via app. To participate, the installation of the free Bremen Bike Citizens App is required. Registration in the app is only necessary if you participate in the monthly part challenges. From April to October 2018 Bremen is on the way to the moon…and back again! Bremen BIKE IT! calls on all people in Bremen to cycle 720.000 kilometers - all the way from the earth to the moon 0and back - as a collective performance. Everyone who wants to participate in the challenge can record all individual bike rides by the Bike Citizens Cycle App. Every recorded kilometer during the time from April until October will be counted to achieve the aim of 720.000 kilometers. If the action is completed successfully, the citizens of Bremen will get a great reward, which makes cycling in Bremen even more comfortable and attractive! All especially motivated cyclists can find monthly individual competitions in the app where they can win great prizes. Registration in the app is possible from the 15th of March. Registration is possible via the app "Bike Citizens". © Yuris Night Bremen e.V. Space, infinite vastness. We are writing the year 2018, these are the adventures of Bremen's space engineers and scientists who have been on the road for years to explore foreign galaxies and explore new technologies. With rockets, space probes, satellites, telescopes and spaceships, theyinvate the remotest corners of the universe that no human being has ever seen before. Now it's time, that they tell us their galactic stories! On 12 April 2018, our experts will leave their usual habitat between the rocket launch pad, observatory, laboratory and auditorium and pay a short visit to the Bremen pubs. While you're sipping your drink, you can listen to the space adventures and get answers to exciting, crazy space questions. Yuris Night Bremen marks the end of the spring series of SCIENCE GOES PUBLIC on April 12th! On Saturday, April 14, at 11 o'clock, Christian Eigenbrod will give the lecture: Project 'SAFFIRE II' - Experiments on fire safety in astronautical space travel. Eigenbrod is Scientific-Technical Director of the Fallturm Betriebsgesellschaft mbH at ZARM, Center for Applied Space Technology and Microgravity of the University of Bremen. There he has been directing the field of “combustion research” since 1993. In addition to questions about fire protection in space travel, the research on mixture formation and autoignition of fuel sprays (low-NOx combustion in diesel engines and aircraft gas turbines) is one of the focuses of his work also as combustion-induced instabilities, such as occur in low-emission lean combustion in gas turbines. Fire on board of a space station is one of the most threatening scenarios for the astronauts in space and all the systems and materials needed for the work and experiments. Fires behave differently in weightlessness than on the ground. The fire detection, the effect of fire-fighting measures and later the cleaning of the breathing air must be adapted to the circumstances. At the beginning of all considerations is the selection of suitable materials for the construction of a space station. But because the material qualification must take place on the ground for cost reasons, the question of how meaningful soil tests are for later use in space is still very controversial. For the SAFFIRE experiments, unmanned aerial vehicles were used for the first time to carry out experiments with open flames on large material samples. Since the spacecraft on the way back from the ISS in the atmosphere should burn up, the risk of these experiments was considered acceptable. The speaker will present the lessons learned in his presentation. How about a journey to Middle-earth? You hear about the legends, learn about their stars, myths and stories, such as the star image of the sickle of the Valar and its fateful meaning. Let yourself be inspired by the legend of how the sun and the moon emerged from the two trees of Valinor or how the sailor Earendil became a star. Look forward to an exciting evening to the skies over Middle-earth and enjoy it with a glass of Elves wine! Including a glass of Elves wine! Appear in medieval garb and receive an additional 1, - Euro reduction. The vast global oceans can best be observed from space using satellite sensors. Their observation is important for ecological, economic, social and political interests. In particular, Earth observation provides knowledge of increasing importance over the environment, e.g. the assessment of climate change. The application of widely used optical camera sensors for maritime situation images is subject to the influence of exposure and weather conditions. Better suited are radar sensors, which also work at night and can see through clouds. For this reason, methods for extracting maritime information from Synthetic Aperture Radar (SAR) images are developed by the German Aerospace Center (DLR) and made available in near real time (NRT). This lecture provides an overview of earth observation techniques, focusing on the use of SAR to support the maritime situational picture. Björn Tings was born on June 29, 1987 in Aachen. He completed his studies in "Scientific Programming" and the simultaneous training as a "mathematical-technical software developer" at the RWTH Aachen in 2010. In 2013 he obtained his master's degree in Artificial Intelligence at the University of Maastricht. Since 2013, Björn Tings has been a member of the team for Synthetic Aperture Radar (SAR) Oceanography at the Institute for Remote Sensing Technology of the German Aerospace Center in Bremen. He is responsible for integrating the research and development of the team into operational prototype software for robust and rapid processing of SAR data. His research includes the automatic detection and classification of vessels on SAR images. As a doctoral student at the Helmut Schmidt University in Hamburg, he works on the automatic detection of bow and tail wave signatures of ships. Organizer: Schulschiff Deutschland e. V.
If you want to know which requirements robots have to meet in order to explore foreign planets, you should not miss the Future Day 2018 at the DFKI Robotics Innovation Center. During an exciting tour through the space exploration hall with its simulated lunar crater and all the other test facilities in the research area, students learn about the various robots and their areas of application. On Saturday, April 28, at 11 o'clock, Björn Tings will give the lecture: Maritime Applications of Satellite-based Earth Observation. Tings earned his master's degree in “Artificial Intelligence” at the University of Maastricht in 2013 and has been working since 2013 at the German Aerospace Center in the “SAR Oceanography” group of the Remote Sensing Technology Institute. Since 2016, he has been doing his doctorate as an external student at the Helmut Schmitt University of Hamburg with the topic "Detecting bow and stern waves of ships on Synthetic Aperture Radar (SAR)". Because of their enormous size, the global oceans can best be monitored by satellite. Various sensor techniques are used to collect data at day and night, thereby supporting environmental, economic, social and political interests. In the "SAR Oceanography" team in particular processors for SAR data are developed, which support a weather and exposure-independent maritime situation picture. Thereby, a use of Earth observation information even without background knowledge is made possible. On Saturday, May 5, Dr. Felipe Guzmán will give the lecture: Observations in Gravitational Physics for fundamental physics, astronomy, and climate change. Explore the Feast of the Celts known as "Beltane" at full moon! The Walpurgis Night was formerly celebrated between the vernal equinox and summer solstice and goes back to the Moon feast. Today, the night of April 30 to May 1, especially on the Blocksberg (Brocken) is known as the Night of Witches. Including a glass of sparkling wine! For the Day of the Sun on 03.05.2018, the Olbers-Gesellschaft invites you from 14-19 o'clock to the lecture "Fascination sun with Ulrich v. Kusserow" as well as for free solar observation, observatory guidance and handicraft actions for children in the Walter-Stein-Sternwarte. The sun is the star that enables our life in the biosphere of the earth. For the amateur astronomers, the sun is a particularly worthwhile celestial object. In addition to sunspots, bright torch areas and huge solar gas clouds are visible. With modern large telescopes and satellites, scientists are researching the sun, its magnetic processes and its influence on the Earth. In this lecture, which is very vividly illustrated by extensive picture and video material, the observed solar phenomena are initially presented. Afterwards you get the explanation of the formation and development of the sunspots and solar gas clouds, the flares, solar flares and coronal mass ejections under often dominating influence of magnetic forces. Finally, the possible influences of the solar wind on the formation of cometary tails and on the formation of aurora in the ionosphere of the earth are briefly explained, as well as modern solar telescopes and solar satellites of the future are presented. Admission to the Walter-Stein-Sternwarte for observations is free. Donations for the preservation and expansion of the observatory are gladly accepted. The sun, moon and star sky tours are basically weather-dependent, on days with cloudy skies and bad weather there are observatory tours and, possibly, spontaneous short presentations and alternative programs in the observatory. Program changes reserved - always updated information can be found on the website at www.olbers-gesellschaft.de or in the event calendar. In all offshoots of the Staatsbibliothek Bremen children from eight years can participate on lectures, handicraft works and riddles around the “Star Wars Universe”. On the 4th of May 2018 we invite you to a slightly different bike ride through space and time! All you need is a safe bike and a lot of fun on an exciting bike ride to unusual places and on short films and stories around the topic of space travel! Approximately 4 stations will be approached, where 3-4 short films will be shown. Total duration of the ride through the night is about 3 hours. Pre-registration is not required. The event takes place exclusively outside, in bad weather, the event is canceled at short notice. On May 5, part of the Jacobs University campus will turn into an art exhibition - with dance and theater, live performances, interactive performances, poetry, photos, painting, and many other varieties of art. In line with the Bremen Space Year, the motto of the "Art Fest" is "Space". The event is organized by students of the Jacobs University, who have joined together in the Art Club of the English-speaking University. The "Art Fest" on the campus should become an open forum, which they help to shape with their own objects and program contributions, but in which artists of Bremen can also participate. The students of the Jacobs University come from all over the world. With the festival, the organizers want to make the diversity and creativity of artists from many different cultures visible and bring the students together with people from Bremen and all those interested in art. Artist and rock star Udo Lindenberg will add galactic glamor to the Art Fest of the Jacobs University with some painted star impressions from his "Udoversum". Cynthia Bolen-Nieland, herself an artist and cultural sponsor at the Jacobs University, had the idea to bring works of art by Udo Lindenberg to the Weser as part of the Bremen Space Year. On Saturday, May 5, Dr. Felipe Guzmán will give the lecture: “Observations in Gravitational Physics for fundamental physics, astronomy, and climate change.”Guzmán studied electrical engineering in Costa Rica. In Germany, he completed his master's degree in engineering physics at the University of Oldenburg. This was followed by a doctorate at the Max Planck Institute for Gravitational Physics in Experimental Physics in Hanover on the subject of space-based gravitational-wave observatories. After receiving his doctorate, he worked for several years in the USA at NASA and NIST. Since the end of last year he has been working at the Institute of Space Systems of the German Aerospace Center (DLR) in Bremen, where he is leading a working group in the field of experimental gravitational physics and geodesy in cooperation with the University of Bremen. Fluctuations of the gravitational field are caused by a variety of phenomena whose precise measurements enable valuable insights that are of great importance for science and society. Through the Gravity Recovery and Climate Experiment (GRACE), these measurements have been able to draw attention to the acute consequences of climate change over the last few years. With the earthbound gravitational wave observatories LIGO and VIRGO, the scientific community has realized amazing technological developments. Not only did it reveal the existence of gravitational waves and thus confirm important building blocks of fundamental physics, it also opened a completely new window into the universe, transforming astronomy and astrophysics from the ground up. The way to the space-based "gravitational wave observatory LISA" could, as the name already suggests, be leveled by the mission "LISA Pathfinder". In his lecture, the speaker presents the scientific findings of modern gravitational physics, its technology development and the associated influence on society. At the Science Show “Skyward” in the Universum® it’s all about reaching for the stars: Why does an airplane fly, what’s the secret behind the start of a space rocket and what other things are suitable as flying objects? Bottles, balls, paper: Various objects are shot, carried, catapulted and flung into the air. What flies highest and why? In good weather, the show takes place in the forum of the outdoor area of the Universum®. Please don’t be surprised if you also see some people walking around in Bremen with a towel. That should be so and that must be so! What would the classic film "Hitchhiker's Guide to the Galaxy" be without the towel? And what would the "Towel Day" be on May 25th of each year without this film, which goes back to a fantasy novel by the British author Douglas Adams? You will know. In the Olbers-Planetarium. And what else, that will be revealed here soon! We raffle 1x2 tickets for the "Towel Day" evening in the Planetarium. Further information will follow soon on www.sternstunden2018.de as well as on Facebook and Twitter. The Olbers-Planetarium invites you to the Long Night of Museums on 02.06.2018 at 6 pm. Information about the individual program items will follow in the coming weeks. Accompanying the Long Night of the Museums - A Great Moment in the Olbers-Gesellschaft "Unknown Worlds"
At the same time, there will be a parallel program from 5 pm to midnight at the Walter-Stein -Sternwarte. However, this program is not part of the Long Night of the Museums, which is why an additional admission fee of 3 euros per person is charged for the lectures. Look forward to lectures on "Unknown worlds"
The launch of the VOYAGER probes took place in 1977. After exploring the outer gas planets of our solar system, VOYAGER 1 made a long journey into interstellar space and continues to send data until today. The "Voyager Golden Record" attracted special attention - it was conceived as a greeting to the aliens. Fly to other stars and galaxies. What are our options and where are the limits? And where do we want to go? Because: The universe is a hostile area! The sun, moon and star sky tours are basically weather-dependent, with overcast skies and bad weather there are observatory tours and, if necessary, spontaneous short presentations and alternative programs in the observatory. Program changes reserved - always updated information can be found at www.olbers-gesellschaft.de or in the event calendar. The Walter-Stein-Sternwarte can only be reached via a staircase. Accompanying the Long Night of the Museums Star hour in the Olbers-Gesellschaft: "Unknown Worlds"
The Long Night of the Museums of Bremen under the motto "Unknown Worlds"
Museums, exhibition halls and galleries in Bremen and the north of Bremen are open on Saturday evening, 2 June 2018 and offer under the motto "Unknown Worlds" an exciting universe for curious culture lovers. The night programs in the houses bring light into the undiscovered corners of the exhibit worlds and, in collaboration with different art genres, bring perception and experience into new vibrations. Around 30 houses participate in the Long Night. Consistent with the Bremen Space Year, the topic is taken up and reinterpreted by numerous actors. The Olbers Planetarium Bremen with the Walter Stein Observatory (Walter-Stein-Sternwarte) of the Olbers Society will also be there in 2018. The door-to-door journeys are included in the entrance fee and lead through night and space by bus and train, a historic tram and several ship shuttles. If you like, join barrier-free tours or accompanied bike rides. To navigate through the night, all the houses are registered on the wheel navigation app Bremen Bike Citizens App. Ticket presales from the beginning of May in the participating museums, Pressehaus Weser-Kurier. The entrance ribbons are valid for all participating houses and during the Long Night of the Bremen museums as tickets in the fare area 1 of the VBN, in the historic tram and on the ships. Aerospace is expensive; - math is priceless! Since 2004, Büskens has been head of the group “Optimization and Optimal Control” and is, since 2009, Director of the Center for Technomathematics at the University of Bremen. A particular focus of his work is the transfer of mathematical knowledge into other branches of science, especially in industry. Typical fields of application are aerospace, autonomous driving, energy, automotive and robotics. Everyone knows mathematics from the school. It is a rather unloved and difficult science and yet mathematics is today considered the language of science. It permeates almost all other branches of science and allows its interdisciplinary networking: "Today's high technology is essentially mathematical technology," it says in an inquest commission of the American Academy of Sciences. The contribution of mathematical optimization alone in the high-technology space sector will be explained in this lecture by means of selected examples, e.g. with new land strategies for future missions to the Moon and Mars, asteroid mining in the planetoid belt between Mars and Jupiter, with a smelting probe on the ice-covered Saturn moon Eceladus but also the importance of the new Galileo satellite system for the current issue of autonomous driving and autonomous navigation. On Saturday, June 9, Dr. Meike List is giving the talk: MICROSCOPE - the first space-based test of the weak equivalence principle. Are you interested in knowing space tour in Bremen city, which is the space hub of Germany? Having 5 space companies, one of which has developed Galileo, the European GPS! Did you know that many segments of the ISS as well as the European Launcher Ariane have been developed in Bremen? And how about the airplane making the very first transatlantic flight from Europe to America? Yes, that airplane was developed in Bremen. In order to get to know all the details as well as meeting a space engineer and asking all your space related questions be sure to JOIN the tour. Registration by sending an email with the title of the event to wia.bremen@gmail.com. Every first Tuesday of the month at 6 pm, students of the Hochschule für Künste give small concerts in the Olbers-Saal in the Haus der Wissenschaft during the events of "Musik um 6". In the Bremen Space Year four events take place around the wide world of space travel - musically interpreted! On June 5th students of the class of Prof. Thomas Mohr and Krisztina Laki from the Hochschule für Künste Bremen will sing. And it's going to be spherical good! Forum science and school / Why don't satellites fall from the sky? Why don't satellites fall from the sky? At the Open House Day, the exciting project contents of the IAT from the field of space and aviation will be revealed to the young and old visitors by touching, trying out and participating. Professors and students of the Hochschule Bremen lead through the departments of the IAT, answer questions and provide information about projects, studies and career prospects. Look forward to discussions, guest lectures by other space operators and partners, and tours with exciting demonstrations. There are also workshops, a poster exhibition and numerous information stands waiting to be visited by you! A registration is not required. The Institute of Aerospace Technology is a competence center for integrated technology development, which enjoys an international reputation in the future sectors aviation and space engineering, wind energy technology, as well as communication and information technology. With its strong application-oriented approach, it is an essential part of a research infrastructure from industry, university and college institutions in Bremen. The IAT is barrier-free, smoking is only permitted outside. On Saturday, the 9th of June, at 11 o'clock, Dr. Meike List will give the lecture: "MICROSCOPE - the first space-based test of the weak equivalence principle". List studied physics at the University of Oldenburg. It was followed in 2011 by the doctorate, also in Oldenburg. Since 2005 she has been working at the Center for Applied Space Technology and Microgravity (ZARM), University of Bremen. Her research interests include simulation (orbital propagation including non-gravitational disturbance forces) and fundamental physics and geodesy tests. In this lecture, the satellite mission MICROSCOPE is presented, which aims to confirm or refute the weak equivalency principle with the highest possible accuracy. First results, as well as the development of the project over time and the contribution of the University of Bremen are presented by the speaker. On Saturday, June 16, Prof. Dr. Claus Lämmerzahl will give the lecture: Satellite geodesy - the measurement of the Earth with millimetre accuracy. Bremen and international artists are taking up the world of space travel. Playfully, gravity gets out of balance. Black holes are explored and childish cosmonauts go on the journey. The performances are suitable for visitors of all ages. On Saturday, the 16th of June at 11 o'clock Prof. Dr. Claus Lämmerzahl will give the lecture: "Satellite geodesy - the measurement of the Earth with millimetre accuracy". Lämmerzahl is a physicist and director of space sciences at the Center for Applied Space Technology and Microgravity (ZARM), University of Bremen. His group focuses on theoretical and experimental research in the fields of quantum theory, general theory of relativity and satellite modeling. In addition to researching the basics, they also work on practical applications in geodesy, positioning and metrology. A global survey of the earth is possible only with satellites. With the help of it, one can detect changes everywhere on earth such as the melting of the Greenland ice, the sinking of the groundwater level in northern India, the increase of Scandinavia and much more. In his talk, the presenter will explain which methods can be used to measure the earth much more accurately than before in order to obtain even better information that are enormously important in identifying and precisely determining changes in our environment. Did you know that our ancestors designated the date of the summer solstice thousands of years ago? Learn how they did that and why the summer solstice is so important in almost all cultures. Including a glass of sparkling wine or juice! The Robotics Innovation Center of the German Research Center for Artificial Intelligence (DFKI) investigates the use of intelligent robots for the exploration of foreign planets. Interested citizens will be able to get an idea of the research work in this field on June 21, 2018, when the institute invites to the open house on the occasion of the Bremen Space Year. The day offers visitors the opportunity to experience many different space robots in action. You can e.g. watch as robots autonomously negotiate the steep slopes of the lunar crater in the 288 square meter big space exploration hall. The robots have also proven themselves outside of the lab, most recently during field tests in the Mars-like desert of Utah and in lava caves on Tenerife, as they also occur on the moon. For tasks which the systems can not independently solve, for example, an exoskeleton can be used for their remote control. Thanks to the portable system, human movements are transmitted directly to the robot. As soon as it encounters an obstacle, the operator receives mechanical feedback through the exoskeleton. In addition, visitors can also visit several autonomous underwater vehicles (AUVs) on the open day. These are also used in the context of space missions, such as in the exploration of extraterrestrial waters. For safety reasons, access to individual integration rooms will be limited to a reasonable number of people as needed. Groups of 10 or more are obliged to register for an appointment under uk-hb@dfki.de. Individuals and small groups can come without a registration. Be there at the premiere! The Olbers-Planetarium Bremen is offering the "Full Moon Special" for the first time on June 28 on the occasion of this year's Super Full Moon! Enjoy the special full moon night of the biggest full moon of the year with a glass of sparkling wine and learn about the myths surrounding the moon. Learn which influences the moon has to life on Earth and what the research says about it - and what all of it has to do with werewolves! To celebrate the special event, we are giving away 1x2 tickets for the "Full Moon Special"! Further information will follow in mid-June at www.sternstunden2018.de as well as on Facebook and Twitter. On Saturday, June 30, at 11 o'clock, Dr. Tra-Mi Ho will give the lecture: " MASCOT – The exploration of a near-Earth Asteroid with a hopping landing surface packet". Ho studied physics at the University of Heidelberg. This was followed by her dissertation on comet research at the University of Bern. During her three-year stay as a Research Fellow at ESA, she was able to deepen her research topic and additionally gain project experience by working for the Rosetta Mission. She is leading the MASCOT project at the German Aerospace Center (DLR) for six years now. The DLR, in collaboration with national and international research institutions from 2011-2014, developed a hopping lander, which is part of the Japanese Hayabusa2 mission. The goal is the scientific exploration of the near-earth asteroid Ryugu in 2018. MASCOT should land on Ryugu and investigate the geology, surface temperature, magnetic field and mineralogy of the asteroid with four scientific experiments. This is to gain insights into the genesis not only of the asteroid itself but also of our solar system and life on earth. The Bremer Summer Academy enables motivated pupils of the SEK II to breathe scientific and research air. For one week, it's time for the students to research, experiment, discuss and finally to present. Participating institutes include, for example, the ZARM, the center of Applied Space Technology and Microgravity. The botanika shows "earthly aliens" this summer. Mother Nature has spawned many amazing beings who served as role models for aliens or simply do not seem to be from this world. The special exhibition is a contribution to the Bremen Space Year. While the smaller visitors search for traces of meteorites in the sand of mars, the bigger ones test their knowledge of aliens or non-aliens. Our animal stars of the "earthly aliens" include: Mantis, Axolotl, Daffodils, Silk Spider and Scolopenda. What these have to do with the science fiction world, you will find out in the special exhibition. Incidentally, the "earthly aliens" spread throughout the botanika, taking in all areas of the Bremen's visitor attraction - from the Japanese Garden, the courtyard garden, the Himalayan Gallery to the discovery center. All components of the special exhibition are marked with pennants depicting the advertising motif of the exhibition. Visitors with elaborate costumes get 2 Euro discount. Admission to the botanika is included in the prices quoted. Starting on 10 July 2018, the German Aerospace Center (Deutsches Zentrum für Luft- und Raumfahrt; DLR) will be staging a newly designed exhibition on the current Hayabusa2 and MASCOT mission in the Untere Rathaushalle (ground floor) of Bremen's town hall. The Japanese space probe Hayabusa2 recently reached the near-Earth asteroid Ryugu on 27 June 2018. The first images and measurements acquired by Hayabusa2 have already been transmitted to Earth. Aboard the probe is the MASCOT (Mobile Asteroid Surface Scout) lander, which was developed in a German-French collaboration led by DLR. The lander will carry four scientific experiments – three of them from Germany – to the asteroid surface in order to examine the geology, chemistry and physical properties of Ryugu. It is planned so far that in October MASCOT will separate from the probe and land a short time later on the asteroid, which is only about 900 metres in diameter. Up to 16 hours of experiments and measurements will then be carried out on Ryugu. For the first time in the history of space travel, a lander – MASCOT – will hop across the surface in order to study different locations. Later in the mission, Hayabusa2 will make contact with Ryugu in order to collect asteroid material and return it to Earth by 2020. The exhibition from 10 July to 14 October 2018 will show how scientists are studying the characteristics and composition of Ryugu. It will also explain the significance of asteroids as primordial matter from the early Solar System, and even demonstrate the threat posed to our planet by asteroids crossing Earth's orbit. Six sections will provide information in both German and English on the diversity of asteroids and their role in the Solar System – the scientific objectives of the mission; the stages of the mission; and the sometimes highly complex maneuvers on the asteroid Ryugu. Videos, large monitors and a photo wall for 'selfies' are further components of the exhibition. The exhibition will open to visitors on 10 July 2018 and will run until 14 October 2018. Opening times: Monday to Friday from 10:00 to 18:00, Saturdays from 09:30 to 16:00. and Sundays from 10:30 to 15:00. Admission is free of charge. The Olbers-Planetarium invites you to a race to the moon! With the moon landing of Neil Armstrong, the first human to enter the moon, the Apollo 11 mission was successfully completed on July 20, 1969! Even decades before the first moon landing there were space pioneers, who had the way to the moon in mind. You will find out in the Olbers-Planetarium who these were. You will also learn the key milestones on the way to astronautical spaceflight and the truth behind the conspiracy theories, including the evidence of modern space travel for the first moon landing! We celebrate this historic date and therefore give away 1x2 tickets for the "race to the moon" in the Olbers-Planetarium. Further information will follow at the beginning of July on www.sternstunden2018.de as well as on Facebook and Twitter. You can look forward to the free offer of the Obers-Gesellschaft in the Walter-Stein-Sternwarte from 3pm to 10pm. The Walter Stein Sternwarte can only be reached via a staircase. On March 24, 2018, the Olbers-Gesellschaft invites you to thrilling lectures, guided tours, observations and craft activities around the theme of "The secret life of the stars" from 3 to 9 pm in the Walter-Stein-Sternwarte. When big stars die, they do so in a very spectacular way. What happens to these giant stars, how does the gigantic explosion happen? The backgrounds of the star death are illuminated here. Even stars do not "live" forever. They are born from interstellar gas clouds and end, depending on their size, in a colorful gas mist or in an inferno - a supernova. We look at the different stars and their way of life. At the same time, the lecture shows how closely we are connected to the stars - they are breeding the elements that make up the Earth, the planets, and the people on Earth. Program changes reserved - always updated information can be found on our website at www.olbers-gesellschaft.de or in the event calendar. The Olbers-Gesellschaft and the Olbers-Planetarium invite on 27.07.2018 to short events, to observe the Mars opposition and the total lunar eclipse. A Mars opposition is the juxtaposition of mars and the sun in the sky: The mars rises when the sun goes down and sinks when the sun rises again. Add to that the exciting event of the total lunar eclipse: the moon completely enters the core shadow of the earth. Information on the individual program items in the Olbers Planetarium will follow at a later date. The entrance fee to the lectures is 3 Euro, for members of the Olbers-Gesellschaft admission is free. The lectures are expected to take place in room A-301. The sun, moon and star sky tours are basically weather-dependent, with overcast skies and bad weather, there are observatory tours and, if necessary, spontaneous short presentations and replacement programs in the observatory. What does seasickness have to do with space travel? On Saturday, the 28th of July at 11 o'clock Prof. em. Dr. Victor Smetacek will give the lecture: " What does seasickness have to do with space travel?". Smetacek was Professor of Bio-Oceanography at the University of Bremen from 1986 to 2011 and continues his research at the Alfred Wegener Institute Helmholtz Center for Polar and Marine Research in Bremerhaven. The renowned Ocean researcher extended his research interests after the stroke of his wife to the areas: organ of balance and body sense (proprioception). His articles to those topics were published in Nature. Both on a ship in the sea and in a spaceship in space you can be seasick. The known and feared symptoms range from malaise and nausea to uncontrollable nausea. Some are dying bad, others feel normal. Why? Why do you get seasick at all and what do the intestines have to do with it? To understand the situation, one has to look at the polluters, in this case the responsible sensory organs. Usually, it’s spoken about five sensory organs, without, however, responding to the closely coupled body perception (proprioception) and the sense of balance (vestibular organs of the inner ear). The lecture will deal with the special role of these two sense organs in seasickness and with the special role of these sense organs for the incarnation and for the development of children in general. Finally, the speaker will answer the question: Can a child born in space develop normally? On Saturday, August 4, Prof. Dr. Peter Baumann will give the lecture: How smarter satellites help to better understand our earth. © Space for Future e. V.
Entdeckungsreise Weltraum - a holiday program from Space for Future e. V.
How do rockets fly? How to become an astronaut? What is the Milky Way? What happens in weightlessness? You are interested in satellites, stars and planets, and you would like to know more about the exciting topic of space? Then you are exactly right in the holiday program "Discovery Space" from 30 July to 03 August 2018! As the largest space travel location in Germany and one of the largest aviation and space locations in Europe, Bremen offers the best conditions for this holiday program. Together with the DLR_School_Lab Bremen you will be programming robots, building water rockets, doing exciting experiments, diving into the world of satellites, and much more! Look forward to astronautical experiments, guided tours of the Bremen space companies and lectures. The "Entdeckungsreise Weltraum" is a five-day holiday program for 13- to 15-year-olds. It takes place from Monday to Friday each from 9 to 16:30 in a small group of about 20 participants. With exciting experiments in the laboratory and outdoors, we take you on an exciting journey of discovery. Registration deadline is June 30, 2018. If there are still places available, interested children can register afterwards. The cost of the five-day program is € 150 per person, including lunch and snacks. Half of the places are reserved for girls. So girls: dare! Source: Space for Future e.V. On Saturday, the 4th of August at 11 o'clock Prof. Dr. Peter Baumann will give the lecture: "How smarter satellites help to better understand our earth". Baumann earned his doctorate at the TU Darmstadt, then worked at the Technical University of Munich and has been teaching and researching for more than 13 years at the Jacobs University in the field of computer science on technologies for "big data", in particular in scientific- technical applications. He has established the principle of space-time "data cubes" in 1992 and is the editor of several industry standards in this field. The "rasdaman" technology developed by him and his team has won a number of innovation awards and is in use on petabyte-sized archives of satellite and weather data. Never before in human history has it been so easy (and so inexpensive) to gain vast amounts of data about the earth: a multitude of satellites are constantly observing the Earth, climate simulations help us better understand the weather, and automated submarine vehicles routinely collect data about the ocean. But this data wealth is not easy to lift. The download of data from satellites already reaches its limits - a familiar expression compares the situation with "drinking from the fire hose", since the data are so numerous and fast that they can hardly be transported. Therefore, such "big data" is also characterized as data that is too big to transport. So it is best to process them directly on-site, for example in the satellite, to answer any questions that may arise. How much vegetation is there in a particular area? Are the forests healthy? Is there an oil spill somewhere on the sea? How does the forest fire spread? In a research project of the Jacobs University, therefore, flexible analysis software will be installed directly in a satellite, which to be launched in 2018 by the European Space Agency. In the lecture, the speaker highlights the challenges involved, the satellite experiment and the new opportunities that arise from it. that leads us to the celestial bodies of our planetary system and beyond. Hands-on experiments help to observe the scientific conditions and demonstrate the technical challenges to make this exciting journey to make our universe experienceable. On the 5th of August the Olbers-Planetarium invites to some very special star moments - the "shooting star special"! August is known as THE shooting star month! Look forward to the coming, warm summer nights and toast to your wishes with a glass of sparkling wine! You will also come into the enjoyment of shooting stars and learn everything about them and their original body! To round off the heavenly evening perfectly, there is a meteorite with a certificate of authenticity for every visitor. including a glass of sparkling wine and a real meteorite! For this special STERNSTUNDEN 2018 moment, we are giving away 1x2 tickets for the "shooting star special" at the Olbers-Planetarium! Further information will follow at the end of July on www.sternstunden2018.de as well as on Facebook and Twitter. The Olbers Planetarium is barrier-free. More information about the venue and the procedure will follow later. shared observation of the night sky and "counting shooting stars"
On Saturday, the 18th of August at 11 o'clock, Andreas Vogel will give the lecture: "News from Saturn". Vogel studied physics and geography at the University of Bremen. Since 2007 he is the full-time director of the Olbers-Planetarium at the Hochschule Bremen and since 2015 a vice-president of the "Gesellschaft Deutschsprachiger Planetarien". In addition, he gives lectures at the University of Bremen in the module "Celestial Navigation" for the nautical students. The Cassini probe brought a wealth of new knowledge about the ring planet Saturn. In September, the twenty-year mission ended with the controlled crash of the probe on the planet. In this talk, the speaker reports about the first landing on another moon through the Huygens probe, explains the spectacular images of the moon Titan and summarizes the many new findings on Saturn, his rings and his at least 62 moons. Celebrating the summer together! Chill-out feel-good atmosphere, grooving, strolling and enjoying: For the thirteenth time visitors can expect music by national and international bands and DJs in the green Neustadt Wallanlagen between large trees and white yurt tents. The SummerSounds offers exquisite culinary delights, diverse activities for children and teenagers and an exciting cultural offer into the night - free & outside. Every year, the festival reinvents itself with constantly changing players, activities and offers. In addition to music, neighborly engagement, networking and integration play a central role at SummerSounds, thereby strengthening our civil society and democracy as a meeting place. Secure free tickets for the opening show of Explore Science in the ÖVB-Arena Bremen! Kindergartens, schools, families and all interested people are warmly invited to the Explore Science start in Bremen on 29 August at the ÖVB-Arena Bremen! An entertaining evening around the topic of astronomy awaits you. Bremen's mayor Carsten Sieling and the managing director of the Klaus Tschira Stiftung Beate Spiegel will ring in the evening with a greeting. Moderator Alexander Königsmann will then press the start button for the show and guide you through the evening. • GlasBlasSing with "Liedgut auf Leergut "
• Free tickets are available from August 8 at the WESER-KURIER ticket agencies and at Nordwest Ticket. Curious? Then get the free tickets and there! Shipping - Aeronautics - Space - Why do you get seasick in space? On a ship in the sea and on a spaceship in space you can get seasick. Mariners know the seasickness, astronauts have also experienced. Why? Why do you get seasick at all? To understand the situation, one has to look at the polluters, in this case the responsible sensory organs. Usually, the five sensory organs are discussed, however without dealing with the closely coupled body perception (proprioception) and the sense of balance (vestibular organs of the inner ear). The lecture will deal with the special role of these two sense organs in seasickness. In a world that demands more and more inner and outer balance, Prof. Smetacek conveys a new perspective of man on our earth and in space. From 1986-2011 Victor Smetacek was Professor of Bio-Oceanography at the University of Bremen and the Alfred Wegener Institute (AWI) Helmholtz Center for Polar and Marine Research in Bremerhaven. In 1964 he completed a Bachelor of Science in Biology in his homeland India and received a scholarship to study marine biology at the Institute of Oceanography at the University of Kiel. As part of an interdisciplinary project, he received his doctorate in 1975 on the plankton of the Bay of Kiel. After his job at the AWI in 1986, he continued his research on the influence of plankton ecology on the global carbon cycle in the Southern Ocean. He has conducted eight international and interdisciplinary research trips with FS Polarstern, including three iron fertilization experiments to determine the role of the Southern Ocean in regulating the atmospheric CO2 content of the past climate cycles. Smetacek has published numerous papers that have led to a fundamental change in our understanding of marine plankton in the earth's climate system. He was involved in many international scientific committees and was awarded several prizes for his achievements. A registration is required and possible at the telephone number 0421-632214. Since 2006, the Klaus Tschira Stiftung organizes the scientific adventure days "Explore Science" in the Luisenpark Mannheim to an annually changing topic. For this purpose, the park of Mannheim is transformed into a colorful tent landscape with exhibitions, hands-on offers, workshops, stage shows, experimental lectures and competitions. With "Explore Science", the Klaus Tschira Stiftung wants to show how exciting natural sciences can be. The central concern is that children and adolescents discover scientific phenomena themselves and that pupils learn from pupils. The Klaus Tschira Stiftung now wants to implement this concept and these goals nationally, and organizes "Explore Science" for the first time in the Bürgerpark Bremen. From August 30 to September 1, 2018, all kindergartens, schools and families in Bremen are invited to explore, experience and discover the world of astronomy. Why do clocks tick differently in space? On Saturday, September 1st, at 11 o'clock, Dr. Eva Hackmann will give the lecture: " Why do clocks tick differently in space? ". Since 2014, Hackmann has been head of the group Gravitational Theory at the Center for Applied Space Technology and Microgravity (ZARM) at the University of Bremen. She researches and teaches about questions from the theory of relativity with applications in the fields of astrophysics, astronautics, and geodesy. Time often appears to us as an absolute quantity, which always runs the same regardless of our position and state of motion. Einstein's special and general theory of relativity, however, shows that the clock is influenced by the speed of the clock as well as by the gravity at the location of the clock. However, this influence is so small that it can only be detected with very accurate clocks. Nevertheless, not only does it play in astrophysics, e.g. in the vicinity of very compact objects such as neutron stars or black holes, an important role, but is also relevant to many daily applications on Earth. The speaker explains some basics and illustrates the resulting amazing effects. Offer for school classes: "Flying"
A look into heaven and to the stars inspires the imagination of every child – who does not want to fly around the world or travel to the moon? What is the best way to move up into the air or in space? How does a skyrocket work? What is the difference to an airplane? Children explore these and other questions in an offer for school classes from 1st to 4th grade by making their own flying objects with help of paper, scissor and glue. The constructs are being tested in the wind channel or at the rocket rail. How has a space rocket to be built to fly as high as possible? Which flying objects hover the longest in the airflow? A great possibility to learn more about flying and to discover the underlying principles of space travels. After the countdown - departure into space. An exhibition with works by Fritz Haase. The 60s and 70s were marked by the departure into the expanses of space, from the race between the Soviet Union and the USA. The subject, the flight of human into space, his connection with the technical instrumentation to detach from the earth and push into unlimited spaces, also attracted artistic exploration. Art moved on the border between non-objective painting, art informel on the one hand, and photorealism and pop art on the other. Art was again open to objective topics such as space travel. In this context, many artists began to experiment with photography and new media such as television. Examples of Fritz Haase from this period can be seen in the exhibition, including drawings, photo collages, serigraphs and etchings from the 60s and 70s. The gallery Carola Bintakies, Antiquariat & Kunst, is barrier-free. Sat. : 10:00 - 14:00 u.n.V. We take off: At the end of our special exhibition "earthly aliens" we arrange a fantastic space event. We expect the German Garrison and other costumed actors from the science fiction scene. There will also be demonstrations of lightsaber fights, a creative space workshop, autograph hours of guest stars, lectures, stalls, awards for the best costume, and more. On Sunday, September 9, we host actor Reiner Schöne, known among other things as the German voice of Darth Vader in "Star Wars Episode III - The Revenge of the Sith" and "Star Wars Rebels" as well as the Optimus Prime in "Transformers". Visitors with elaborate costumes get 2 Euro discount. Admission to the botanika is included in the prices. On Saturday, 15 September at 11 o'clock, Prof. Dr. Kerstin Schill will give the lecture: "Autonomous Navigation in Space". Schill studied computer science at the Technical University of Munich and holds a doctorate in the Faculty of Medicine of the Ludwig-Maximilians-University in Munich. Since 2003 she is a professor at the department of Computer Science and Mathematics at the University of Bremen and head of the research group "Cognitive Neuro computer science ". In addition to her university position, she was vice speaker for the "Artificial Intelligence Group" of the GI (Society for Computer Science) and member of the board of the SFB / TR8 "Spatial Cognition". Since 2011, Prof. Schill has been Dean of the Department of "Computer Science and Mathematics" at the University of Bremen and, since 2014, speaker for the science focus Minds-Media-Machines of the University of Bremen. In addition, she has been the Senator of the German Research Foundation since 2014. How can spaceships be alone in space for more than 30 years and without any contact with the earth, gather knowledge and take samples? What are the prerequisites for this and what must they be able to do? In the talk, the speaker explains the area of "autonomous space flight" and the challenges of missions beyond the lifetime of the developers. Autonomy requires "intelligent" behavior, the model is the human, which means that human performance of perception and decision-making is examined and transferred to space missions. A CanSat is a satellite in the size of a beverage can and is developed, build and programmed by student-teams. This mini-satellite will be brought into a height of several hundred meters and is going to drop with a parachute. At the same time it has to take measurements and complete other tasks for whose it was constructed. A CanSat serves as a model for a real space mission because basically the same phases as in a real space mission are run through: The Planning of the mission, construction of the satellite, test of the single components and the total system, implementation of the mission, preparation and evaluation of the dates, communication of the results. This way, the CanSat-competition allows dedicated and talented students to a first practical and authentical experience with a space project. The German CanSat-competition is integrated into the international competition of the European Space Agency (ESA). The winner of the German competition is qualified for the participation on the European contest. be given by the location or a content, but it may also be derived in an unconventional way - there are no bounds to the imaginaton. There are public and jury prizes worth a total of 3,500 EUR. What all this has to do with the Bremen Space Year, you will leartn at the latest on Friday, the 14th of September. Then the motto will be announced at 4pm on the website of the Filmfest [filmfestbremen.com/klappe link] and on Facebook [www.facebook.com/filmfestbremen/link]. On 20.09.2018 there will be the big screen premiere: As part of the Filmfest Bremen all submitted film works run on the big screen [Calendar of events for 20.09. to link]. All information and conditions for the short film competition KLAPPE! can be viewed at www.filmfestbremen.com. All information and conditions for the short film competition Klappe! can be viewed at www.filmfestbremen.com. Participants in the short film competition have free admission. Registration for the competition in September 2018, link event post to KLAPPE. Tickets at Nordwestticket und at the Bremer Filmkunsttheaters. The equinox was already by the Mayas considered an extraordinary day. After all, they built large temples to celebrate it! Learn in the Olbers-Planetarium which cultural and astronomical secrets are hidden behind the date that rings in the polar night on the North Pole and the astronomical beginning of autumn in the northern hemisphere. Perhaps nothing stands in the way of your astronomical happiness soon? We are giving away 1x2 tickets for the "equinox" in the Olbers-Planetarium! Further information will follow at the beginning of September on www.sternstunden2018.de as well as on Facebook and Twitter. The Olbers-Gesellschaft invites you to the day of the Walter-Stein-Sternwarte on 23.09.2018 from 15 to 22 o'clock. On this day is also the equinox. At the equinoxes, the sun is just above the equator at the zenith. The days are then around the world for about 12 hours. Were intelligent signals from space recorded on August 15, 1977? What secret does the star KIC 8462852 hide? Will aliens in the distant future receive messages from humankind? Why are 21 cm suitable as a cosmic unit of length? The history of the search for extraterrestrial civilizations is rich in exciting questions. The most important question, however, remains: will we ever discover it or are we alone in this unimaginably vast universe? On the 27th of September 2018 from 7 p.m. the KLUB DIALOG is going take a closer look on the issue of Bremen as a base for space industry, bringing out the creative minds behind the planets. We are going to enter foreign worlds, nosh space nuts and look at everything from outer space. Who will enter our space shuttle and which black holes will be explored? Be ready for surprises! The exact venue will be announced! Strong flooding on the high seas: With on-board resources the leak can’t be plugged, the ship threatens to sink. Such a scenario would have inevitably led to the sinking of the ship until the beginning of the 20th century, because a cry for help would have gone away unheard. That changed only with the spreading of the marine radio. And at least since the modern satellite positioning no one is completely "alone" on the oceans. How space travel, and especially satellite technology, has changed the work of sea rescuers, is described by Dipl.-Ing. Michael Jetzschmann and Captain Dirk Hinners-Stommel in their presentation. • How can an AIS ship transponder – i.e. the automatic identification system of ships - be located from space? Rescuing castaways from distress. Get people out of danger. To care for injured and sick people. The rescue boats are used on the North Sea and Baltic Sea - around the clock and in all weather conditions. The DGzRS is one of the most modern sea rescue services in the world. It finances its work exclusively through donations and voluntary contributions. The DLR is the research center of the Federal Republic of Germany for space, energy, transport, security and digitization. Its research and development work is involved in national and international cooperation. Its mission includes exploration of the earth and the solar system, as well as research into preserving the environment. On Saturday, the 29th of September at 11 o'clock Ulrich v. Kusserow will give the lecture: "The Earth Magnetic Cage and Space Travel travel". Kusserow completed his study in Astrophysics on "Stationary spherical alpha-omega dynamo and the Earth's magnetic field" and worked for more than ten years as a high school teacher of mathematics and physics. He was for many years chairman of the Olbers-Gesellschaft Bremen and is, among other things, member of the Astronomical Society, an international association in which the professional astronomers are organized in the German-speaking area. Today, Kusserow focuses on the didactic aspects of modern astronomy, with the topics of cosmic magnetic fields, star formation and solar processes, as well as the climate problem. The Earth's magnetic field is generated internally by dynamo processes. The consequent existence of the terrestrial magnetosphere not only prevents the removal of excessive amounts of earth-atmosphere particles into the universe. In particular, it also supports the protection of life development in the Earth's biosphere from the influx of high-energy and life-threatening particle radiation emitted by distant cosmic sources, such as active galactic nuclei, supernova explosions, or emitted after solar eruptions. High-tech devices aboard satellites can be destroyed and the health of astronauts seriously endangered if this dangerous cosmic radiation outside the Earth's magnetosphere, for example, on the space flight to Mars has too strong influence. In this lecture, which is clearly illustrated by extensive pictorial material and video sequences, first of all the generation of the earth's magnetic field as well as the different protective functions of the magnetosphere for life on our planet are explained. After that, the diverse influence of space weather on planned astronautical satellite missions, in particular to the planet Mars will be critically analyzed. On Saturday, October 6th, Prof. Dr. Andree Kirchner will give the lecture: International Law and Law of the Sea Aspects of Space Law. In all branch offices picture book cinemas and craft activities for children from the age of 4 will be offered during the autumn holidays 2018 on the motto space. Admission is free but there may be a fee for crafting materials. Registration for the crafting activities is required, more information will follow soon. The trained TV-actress and passionate storyteller Maja Nielsen is the author of the popular “Abenteuer!-series”. With her Book “Kosmonauten” she provides insight into the history of space and tells about experiences of several cosmonauts. Her readings are accompanied by image and listening material. Space delighted children from eight years old can look forward to an exciting experience. At the time of the school holidays children from four years can participate by handicraft activities and storybook cinemas especially to the theme space in all offshoots of the Staatsbibliothek Bremen. The entrance is free but there might be a fee for used handicraft material. The world's largest space congress, the International Astronautical Congress (IAC) is coming to Bremen in 2018. Approximately 4,000 scientists from around 60 nations are expected. In addition to a broad programme of lectures, the IAC also offers a large industrial exhibition. The IAC opens its doors on the Public Day. Get a taste of space and let yourself be fascinated by exciting new ideas about space travel. The Olbers-Planetarium Bremen and the Olbers-Gesellschaft open their doors on the 03.10.2018 for the "Türöffner-Tag" of the "Sendung mit der Maus" and allow curious "MausFans" insight behind the scenes. Information on the individual program items in the Olbers-Planetarium will follow at a later date. Initiated by WDR "Die Sendung mit der Maus"
© Heimatverein Lilienthal e. V.
The Heimatverein Lilienthal e. V. participates in the Bremen Space Year with a contribution around the life and work of the German astronomer Johann Hieronymus Schroeter. In the museum with Schroeter archive historical astronomical instruments of J. H. Schroeter and from his time are shown on 3 October. Learn more about his family history up to today's offspring. Display boards and books, including the work "Selenotopographische Fragmente", which was written by J. H. Schroeter, complete the exhibition. The authors of the book "Von der Sternenwelt fasziniert", Peter Richter and Harald Kühn, also provide information on site. Admission is free, donations are welcome. KunstWerk Im Viertel Preview "artist in spaces"
The studios of the artists and artisans of the “Viertel” are opening their doors to the Space Congress: With "artists in spaces" guided tours of the studios and the “Viertel” are offered. At an information booth, both residents of Bremen and the participants of the congress receive information about the studios. On the evening of October 4th, there will be small experimental concerts, where a "come together" between the residents of Bremen and the participants of the congress will be made possible. In the studios there will be works from each of the trades on the topic of the Bremen Space Year 2018. With "artists in spaces", the participants of the IAC 2018 as well as all other interested parties are invited to the Viertel and to 35 studios. English speaking tours are offered through the studios and the Viertel. At an information stand you will receive all information about the studios. In some studios there will be works on the motto of the Bremen Space Year STERNSTUNDEN 2018. Spheric hang music and spacecocktails go along with a presentation of timeless jewelry and exquisite hat creations. Come over and twinkle! Research for space travel and research in space are keys to innovations that are also directly relevant to life on earth and offer a wide range of new innovations. Opening up perspectives and influencing our lives. The INNOspaceEXPO presents important, surprising and exciting innovations. "The International Youth Symphony Orchestra invites you to a classical concert with young musicians from different countries. Enjoy the concert with up to 190 musicians from 21 different countries and some members of the Youth Symphony Orchestra Bremen. Under the direction of Martin Lentz, the musicians will work on a composition under the motto of the Bremen Space Year STERNSTUNDEN 2018. On the 5th of October, you will enjoy this world premiere at the official closing concert of the space year. The presale is expected to start in June 2018. Pupils autumn-internship at the DFKI Robotics Innovation Center: Space Robotics - what does a scientist's everyday life look like? At the pupils autumn-internship from October 8 to 12, 2018, IT and technology enthusiastic pupils can gain practical work experience at the German Research Center for Artificial Intelligence (DFKI) in Bremen. Supervised by scientists from the research area Robotics Innovation Center, they gain exciting insights into the development of robotic systems for the space industry of the future. Which steps are necessary to develop a robot? The girls and boys learn about this from, among others, computer scientists, electrical engineers, mechanical engineers, physicists and neurobiologists. In addition to professional know-how, valuable tips on training and studies will be conveyed. In addition, the pupils can demonstrate their talent in practical applications. The limited number of seats can only be determined in the summer of 2018. Please send your application to: ric-bewerbung@dfki.de. Participation for pupils from 12 years. On Saturday, 13 October at 11 o'clock, PD Prof Dr. Volker Perlick will give the lecture: "Detecting gravitational waves in space". On Saturday, 13 October at 11 o'clock, PD Prof Dr. Volker Perlick will give the lecture: "Detecting gravitational waves in space". Perlick studied physics at the Technical University of Berlin, where he also did his doctorate and habilitation. After several years abroad, i. a. as a lecturer in Lancaster (UK), the theoretical physicist joined the Center for Applied Space Technology and Microgravity (ZARM) in Bremen as a research associate in 2010 and has been an outside lecturer at the University of Bremen since 2013. In 2017, the Nobel Prize for physics was awarded for the direct observation of gravitational waves, which was first achieved in 2015. These waves, predicted by Albert Einstein as early as 1916, give us the opportunity to obtain completely new information from black holes, neutron stars and other objects in the universe. In his presentation, the speaker explains the advantages of stationing gravitational wave detectors in space. According to current planning, such first detector (“Lisa”) could start in the early 2030s. On Saturday, the 3rd of November at 11 o'clock Sven Stappert will give the lecture: "SpaceX – Reusing launcher vehicles for space flight". Stappert studied space engineering at the University of Stuttgart. His master's thesis, which he wrote at the German Aerospace Center (DLR), was titled "Reusability of launcher vehicles by the method of SpaceX". Since 2016, he works as an engineer for space transport systems at the DRL in Bremen in the department "System Analysis Space Transportation". The focus of his work is the research of methods of reusability of launchers, both according to the method of SpaceX as well as other visionary approaches (winged stages such as space shuttle, etc.). In the last decade, increasing privatization of space has turned companies like “SpaceX” into global players in the space industry such as serious competitors to established space agencies. SpaceX seeks to reduce the cost of space travel by seeking partial or complete reuse of the launchers. Therefore, SpaceX uses the concept of vertical landing with its own engines to land the first stage of the Falcon 9 launcher after a successful mission either on land or on a ship in the sea and re-use it for a later mission. In the future, SpaceX plans to launch missions to the Moon or Mars with a newly developed space transport system, designed to be fully reusable, allowing the masses access to space. Saturday, 17 November at 11 o´clock Dr. Waldemar Bauer will give the lecture: “ReFex - In Flight Testing of Reusable Launch Vehicle Systems in Australia”. Bauer studied mechanical engineering at the Hochschule Bremen with a focus on space engineering and completed his doctorate at the Technical University of Braunschweig. He has been working at the Institute for Space Systems in Bremen since the beginning of 2009 and has been a systems engineer since June 2016 as part of the DLR large-scale research project ReFEx (Reusability Flight Experiments). The reusability of space transportation systems is the key to reducing the cost of future space missions. Accordingly, the German Aerospace Center (DLR) is developing and testing key technologies needed for the realization of reusable systems. The ReFEx (Reusability Flight Experiments) project aims to conduct in-flight testing of various technologies. The launch of the flight demonstrator is scheduled for the year 2021 in Australia. The primary project goal is to map an aerodynamically controlled reentry of a winged space transport system. With the aid of the measurement data obtained experimentally in the future, e.g. technical systems and simulation models should improve. Saturday 24th, Dr. Sven Herrmann will give the lecture: New technologies - quantum sensors in space. Saturday, 24 November at 11 o´clock, Dr. Sven Herrmann will give the lecture “New Technologies - Quantum Sensors for Space Application”. Herrmann studied Physics at the University of Konstanz before he completed his doctorate in experimental physics at the Humboldt University in 2007. This was followed by a two-year stay as a post-doc at the Stanford University, where he dealt with matter wave interferometers. He has been pursuing this topic since 2009 at the Center for Applied Space Technology and Microgravity (ZARM) of the University of Bremen with regard to future applications in outer space. Right there he is currently leading the experimental gravity and quantum optics group. Quantum physics is one of the essential theories of physics and very successfully describes our world in the microcosm on the smallest lengths and time scales. Many of the phenomena of quantum physics seem strange to us and are difficult to unite with the everyday perception of the world. In his talk, the speaker will explain some of these "strange" quantum phenomena and then show how quantum physics allow to build very novel and particularly sensitive measuring instruments. Finally, he will discuss how currently in various places worldwide, e.g. also at the drop tower in Bremen, already the employment of such quantum sensors and other quantum technologies for the employment in space travel are prepared. Saturday, September 8, Prof. Dr. Angelo Pio Rossi will give the lecture: Alien geology: a tool for exploration of the solar system. Saturday, December 8th at 11 o´clock, Prof. Dr. Angelo Pio Rossi will give the lecture: “Alien geology: a tool for exploration of the solar system”. Rossi studied geology before obtaining his doctorate in 2004 on planetary science. He then worked for three years at the European Space Agency (ESA) in the Netherlands and continued his research for two years at the International Space Science Institute (ISSI) in Bern, Switzerland. Since 2010 he has been working and researching as a professor at the Jacobs University Bremen gGmbH in the field of earth and planetary research. Earth geology research has always been driven by the spirit of discovery: from understanding its processes and mechanisms to finding and exploiting its resources. The solar system holds geologically diverse worlds. To explore them by spaceships, astronauts or a combination of both, modern technologies must be used as well as the tools that have been developed by geology in recent centuries. The lecturer will discuss current and future planetary research and explain how it can benefit from geological approaches, methods and experiences. Say goodbye to the shortest day of the year, the winter solstice, at the Olbers-Planetarium and see why the winter solstice is so important in so many cultures. Another date for the winter solstice will take place on 22.12.2018 at 7 o'clock in the Olbers-Planetarium.